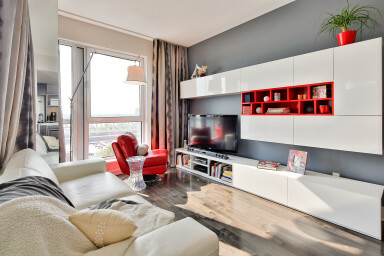 Located on De La Commune Street in Old Montreal, with 790 sq.ft. this 1-bed 1-bath condo features a private balcony, telescopic windows and high ceilings. Building amenities includes an indoor/outdoor swimming pool, a fitness center and an interior courtyard. This fully-furnished unit is ideal for executive stays in the city. With hardwood floors throughout and eclectic décor, guests staying here will enjoy the beautiful view of the Clock Tower as well as the fully-equipped kitchen complete with European-style cabinetry and granite breakfast bar. A four-person dining table and adjacent private balcony are great for entertaining and the designer bathroom is complete with mounted vanity and soaker tub. The master bedroom holds a queen-size bed making this unit an ideal suite in Montreal. The Solano building was completed in 2013 and offers a truly urban experience. With 124 unique units, the two-phase project is ideally located on the newly redeveloped marina and the Old Port’s waterfront. Solano’s guests can enjoy top amenities including a multi-leveled interior garden, full fitness center, sauna and indoor swimming pool. Guests also have access to the stunning rooftop sun deck and outdoor swimming pool as well as the shared lounge. The Old Port of Montreal remains the city’s most coveted address. The former gateway to city, guests staying here will be charmed by Old Montreal’s cobblestone streets and the port’s beautiful Promenade. Check out the Clock Tower and its urban beach, the Montreal Science Center and Imax and no shortage of places to eat and drink. When staying in Montreal, the Old Port is sure to impress!